In Havana’s Chinatown, the Lung Kong is a charitable clan association run by Alejandro Chiu. The association also runs a home for Chinese elderly and supports itself by operating a Chinese restaurant on the side. Back in Barrio Chino, we go beyond the “Chinese Fantasy” created by the Cuban government to discover the legacy of a community that dates back to 1847 and has now become truly Cuban. I wanted to open the episode like Wim Wenders’ Buena Vista Social Club, a panning shot of vintage American cars swooshing along the Malecon waterfront with winter waves beating off the breakwater. But the sea is calm at this time of the year and no drama was to be had. Instead, I found beauty in the dilapidated buildings along the waterfront and the faded paint peeling off their walls. There’s a beauty in decay that hints of the past glory and the vibrant colours these buildings once possessed. We shot endlessly among the ‘ruins’ with Fermin Heuy singing Fantasia Chinesca. Cuba will always remain the most memorable shoot of our four-year road trip. We had a hard time saying goodbye to our three main characters: Alejandro Chiu the restaurant owner, Fermin Huey the singer, and Luis Chung the hustler. Each plays a role in Castro’s Cuba and the crumbling barrio chino.The closing shot of children playing ball on the street was taken from the third floor balcony of Roberto Lee’s martial arts studio inside a Chinese association. The end-of-day street life that we find everywhere in Havana closes the episode, accompanied by Fermin singing Nat King Cole’s Fascination. 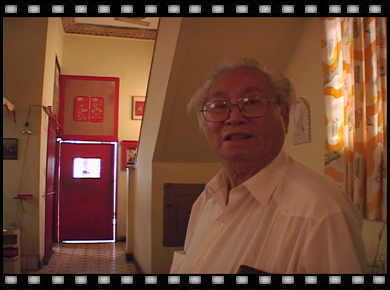 Bruca Manigua often appeared in Cantonese films in the sixties where the cha-cha and rumba served as musical backdrops to family drama. Cuban music was popular in Hong Kong in those days. And because of the presence of large Chinese settlements, Chinese music also had a great impact in Cuba. Cuban music now incorporates such traditional Chinese instruments as cajita china(wooden box), corneta china (cornet), and tomboures cu (drums). Fantasia Chinesca, with Chinese musical motifs and faux pentatonic chords, was composed by Julio Brito and sung here by Fermin. El Chino del carnaval died in October 2005. He was 87.